I started thinking about this menu a couple of weeks ago and from the get go I was sure of a couple of things: I wanted to incorporate seasonal ingredients, I wanted the menu to include some of Brittany’s favorites, and I wanted it to be casual comfortable food because it was all about great girlfriends getting together to celebrate a birthday…so this is how it came together. 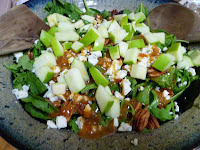 The inspiration for the salad came from a post by The Novice Chef, but I did make some changes changes: I couldn’t find watercress even tough I went to 3 different groceries, honestly I really don’t care for pears, and I wanted to serve the salad family style to keep it in the tradition of the rest of the meal (aka – I don’t have the time or the patience to make the “stacks,” but if I did I would have done it her way). 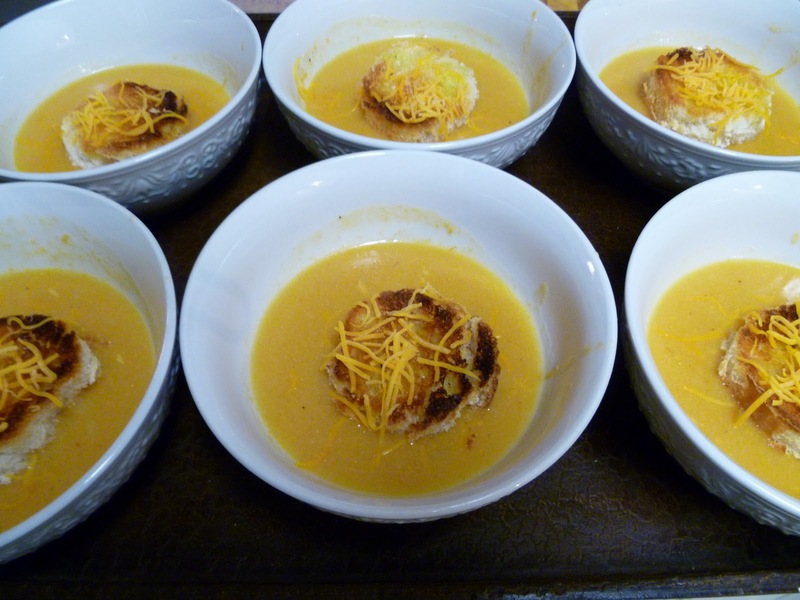 As for the soup, Brittany and I both love beer and who doesn’t love cheese, so beer cheese soup was the perfect choice. The soup is rich, but not too filling (so long as you don’t eat the whole pot). It was great as the second course. 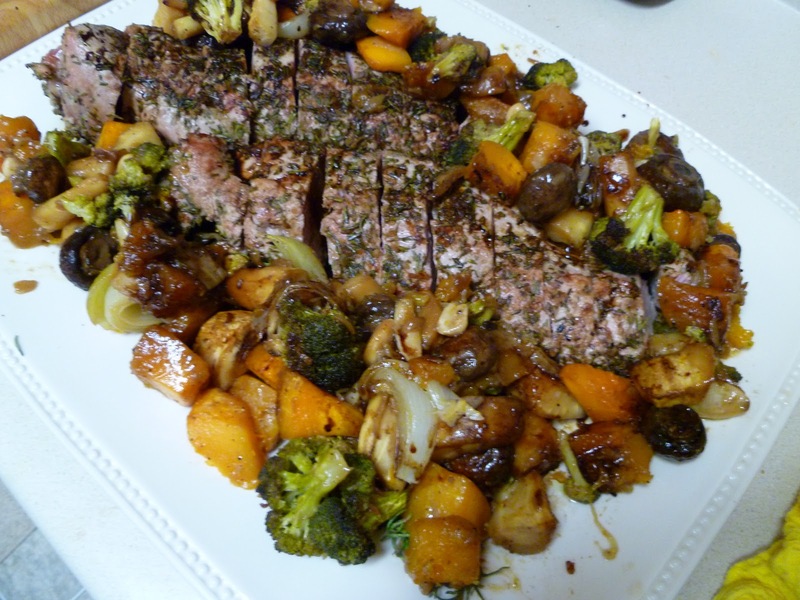 The rosemary pork tenderloin is one of my favorite recipes and one of the first things I posted on the blog. I knew it was perfect for a party because the majority of the cook time is hands off in the oven, and it is amazingly tender, juicy and delicious. I paired it with a twice baked potato because I believe everyone loves them, I mean potato, heavy cream, sour cream, cheese and chives…HELLO! To round it out, the roasted vegetables had so many fall flavors and colors and they were super simple! Finally, Nigella Lawson was featured in the October issue of Better Homes and Gardens and when I saw Margarita Cream and Chocolate Cake, there was not a doubt in my mind that I had to make it for the birthday girl. I hope you enjoy the recipes below (note – I am just linking to the original Nigella recipe because I did not change it in any way) and throw your own dinner party soon…let me know how it goes! Dice the onion and mince the garlic. Heat oil in a dutch oven over medium high heat. Add the onion and cook for about 5 minutes until slightly translucent, being careful not to brown. Then add the garlic and stir well, cooking for another 2 minutes or so. Sprinkle the flour into the pan and whisk for about 3 minutes, then add the stock. Let the mixture come up to a boil, then reduce the heat to medium and add the cheese stirring with a wooden spoon until it is fully incorporated. At this point you can let it simmer for a couple of hours if you need to. Add the bottle of beer about 3 to 4 minutes before serving. After stirring in the beer let the soup come back to a simmer, and then ladle into serving bowls. I served the soup with a piece of toast and sprinkle of cheese floating on the top. I just cut rounds out of pieces of bread using my biscuit cutter and then toasted them. This is not necessary but did a little something extra. Pour the onion soup packet into a small bowl and add the olive oil; let them sit for at least 20 minutes so the flavors infuse. Peel the butter nut squash and cut into 1 inch cubes. Cut the broccoli from the stem into florets, and peel the parsnips and cut in to 1 inch pieces. Peel the onion and cut into 8ths. Add all the vegetables to a large bowl and pour the olive oil mixture over them and stir well. Pour vegetables into a roasting pan and cook at 400 degrees for about 40 minutes, stirring once half way through. Preheat oven to 400 degrees. Wash potatoes and poke each with a fork once or twice, then season with olive oil, salt and pepper. Bake potatoes on a cookie sheet for 45 minutes to an hour, until you can give them a little squeeze. Remove potatoes from the oven and when they are cool enough to handle, cut them in half and scoop out the middle. Mix the “potato guts” with the remainder of the ingredients and salt and pepper. (I do this with an electric mixer, but you can do it by hand – get those muscles going!) Spoon the mixture into the potato skins and then bake again at 400 for about 30 minutes. All I think about is food! Remix: Cheesy Chicken Casserole with CRUNCH! For a Crowd: Bacon and Cheese Biscuits again!